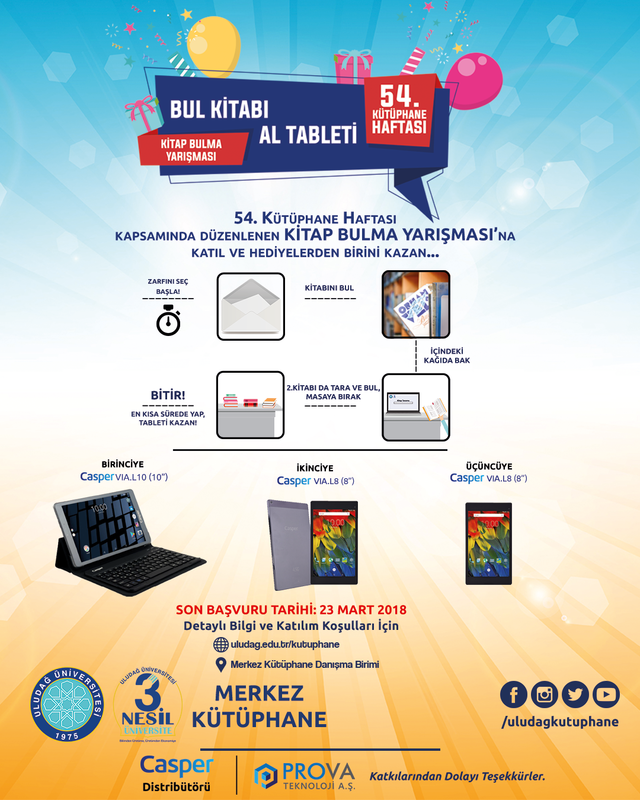 Within the scope of 54th Library Week (26 March-01 April 2018); "Book Finding Competition" will be organized by Uludağ University Library and Documentation Department. 1. The Book Finding Competition is open to all students studying at Uludağ University. 2. Persons who will apply for the competition must come to the Central Library Advisory Unit and apply in person. 3. Competitors should not be working half-time in the library right now. 4. The identity and contact information of the competitor must be complete in the Application Form. 5. Persons applying for competition may not transfer their rights to another person. 6. The deadline for entry into the competition is March 23, 2018. Applications will be made to the Library Advisory Unit during working hours (08.00-17.00). 20 competitors will be selected from among the applicants to participate in the contest. The names of the applicants will be written on small papers and placed in a box. 20 people will be selected in a draw made on live broadcast from Uludağ Library official facebook account. After the draw, selected candidates will be communicated and invited to the competition on a date determined by the Library. The competition will be held on a date between 27-30 March 2018 to be determined by the Library. Each competitor will compete separately. The first contestant will choose one of the envelopes previously identified by the Library containing the catalog images (where the book's place number is printed). With the start of the chronometer, the competitor will find the book on the shelf. There will be another envelope in the book, and this time only the title of the book and the name of the author will be written. The competitor will find the book by scanning from the computer reserved for the contest that day and will leave it to the desk of the attendant along with the book he found earlier. With the books left to the table, we will stop the chronometer. The three fastest people will be determined after these two stages, which will be done for each competitor, and these 3 people will be awarded. The 4th, 5th and 6th place winners will be determined as substitute winners if the first 3 winners do not receive their awards. The award ceremony will be announced with a subsequent announcement.